Burlington, ON - MI-BOX mobile storage containers are designed to give you the protection you need and convenience you deserve. Strong enough, safe enough and secure enough to keep your valuable household items. They are delivered and picked up using our patented LeveLift System. They are gently placed on any surface and picked up levelly. This protects your contents from shifting and possible damage. 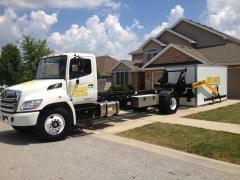 MI-BOX services all of Burlington, Ontario and the surrounding areas. We're locally owned and operated. We offer the best prices and services available for all your mobile storage container needs. Rent one today. Mobile Storage is the most convenient and cost effective way to move or store just about anything. MI-BOX brand mobile storage units are safe, secure and sturdy enough to handle any size job. They can be kept outside or stored inside our warehouse. 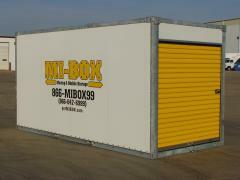 MI-BOX mobile storage units are rented by the month, just like self storage. The big difference is that we deliver the storage container right to your home or business. There's no need to leave home. No truck rentals and best of all no time restraints. Reduce your stress with moving and storage. Load at your convenience and let us do the driving for you. MI-BOX is locally owned and operated and we value your business. Experience the MI-BOX difference. MI-BOX containers are 16 ft. long and are always delivered levelly using our patented LeveLift System. Your belongings are safe and secure at all times. Each storage container is equipped with a large roll up door and secure latch for locking it. Only you have the key! So, if you're looking for the best prices and service in and around Burlington, Ontario - then let MI-BOX help today. If you're in need of a moving company around Burlington, ON, then look no more. MI-BOX is the new way of moving anywhere around Burlington, Hamilton, Toronto, GTA or anywhere in southern Ontario. We deliver moving containers - you load them and we move them. No more high priced full service moving companies. You can save thousands of dollars with MI-BOX. We also give you options and time. Since our moving containers are delivered right to your door - you can take the time you need to load them. After work, on weekends, have the kids help or whenever time permits. No more time and hassles with renting and driving a truck. Once it's loaded, we'll pick it up and move it for you. At your new home, you'll also have the time you need to unload. No more rushing. Take your time with MI-BOX because each moving container is rented by the month. If you need help loading, then we can recommend a professional moving company to assist. You can do the easy stuff and let them do the heavy lifting. No matter what you're moving needs are - MI-BOX can help.